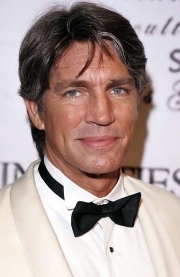 Eric Anthony Roberts is an American actor. His career began with King of the Gypsies , earning a Golden Globe nomination for best actor debut. He starred as the protagonist in the 1980 dramatisation of Willa Cather's 1905 short story, Paul's Case. He earned both a Golden Globe and Academy Award nomination for his supporting role in Runaway Train . Through the 1990s and 2000s he maintained dramatic film and TV-movie roles while appearing in TV series. His television work includes three seasons with the sitcom Less Than Perfect and a recurring role on the NBC drama Heroes. His sisters Julia Roberts and Lisa Roberts Gillan, and daughter Emma Roberts, are also actors. Eric got his start on the now defunct NBC daytime soap opera Another World originating the role of Ted Bancroft from February 14, 1977, to June 17, 1977. Roberts received Golden Globe nominations for his early starring roles in King of the Gypsies and Star 80 . He was nominated for the Academy Award for Best Supporting Actor in 1985 for his role as the escaped convict Buck in the film Runaway Train. In 1987, he won the Theatre World Award for his Broadway debut performance in Burn This. Roberts's other starring roles included Raggedy Man , The Pope of Greenwich Village , The Coca-Cola Kid , Nobody's Fool , Best of the Best , By the Sword , Best of the Best 2 , The Immortals , La Cucaracha , Purgatory , and Stiletto Dance . He also had major supporting roles in Final Analysis , The Specialist , and the film Shannon's Rainbow . He played the Archangel Michael in The Prophecy II . In 1996, he appeared in the Doctor Who Television film in the role of the fourth Master. As of 2011, he is the only American actor to play the role. When SFX listed previous Masters in Doctor Who, the magazine said of Roberts: "Out-acted by a CGI snake in the same production." His recent projects include A Guide to Recognizing Your Saints, DOA: Dead or Alive and Royal Kill. He appeared in The Dark Knight as Sal Maroni, a Gotham City Mafia boss who hires The Joker to kill the titular superhero and a renegade mob accountant. Roberts co-starred on the ABC situation comedy Less than Perfect. He appeared in an episode of CSI: Miami as Ken Kramer, a murderer on death row convicted of killing a young couple. Another notable TV appearance was the episode "Victims" of Law & Order: Special Victims Unit where he played Sam Winfield, a former cop turned vigilante. In the same year, he was also guest starred on The L Word as Gabriel McCutcheon, the father of Shane McCutcheon. In early January 2007, Roberts starred in the two-part mini-series Pandemic as the mayor of Los Angeles. Roberts voiced the Superman villain Mongul in the animated series Justice League and reprised his role in Justice League Unlimited in the episode "For the Man Who Has Everything". He performed the voice of Dark Danny in Nickelodeon's Danny Phantom. He appeared in the first season of Heroes as Thompson, an associate of Mr. Bennet. He then reprised the role in the third-season episode "Villains" and in the fourth-season "The Wall". Roberts appeared in The Killers music video for their song "Mr. Brightside" as well as in the music videos for Mariah Carey's "We Belong Together" and "It's Like That". In 2006, he appeared in the video for Akon's "Smack That", featuring Eminem. In 2007, he appeared in the video for Godhead's "Hey You". He appeared as a panelist on the television game show Hollywood Squares. In February 2009, Oscar nominee Mickey Rourke, who starred with Roberts in The Pope of Greenwich Village, said he hoped that Roberts would soon be offered a role which would resurrect his career in the way that The Wrestler rejuvenated Rourke's. He portrayed Seth Blanchard on the second season of the Starz series, Crash, from 2009. In 2009, Roberts appeared as himself in "Tree Trippers", a season five episode of Entourage. He is portrayed as a mushroom and drug fanatic as he gives the boys mushrooms and joins them to Joshua Tree National Park to trip as they contemplate Vince's next movie decision. It was announced in June 2010 that he would be joining the cast of the CBS soap opera The Young and the Restless starting July 12. In 2010, he appeared in the action film The Expendables. Later that year, he appeared alongside Steve Austin and Gary Daniels, his co-stars from The Expendables, in the 2010 action film Hunt to Kill. December 2010 saw the premiere of the fourth season of Celebrity Rehab with Dr. Drew, which documented Roberts' struggle with addiction to marijuana. Roberts' daughter Emma Roberts, with his then-girlfriend Kelly Cunningham, was born on February 10, 1991. Emma eventually became an actress as well, making her film debut at age 9 in the 2001 drama Blow. After Roberts' relationship with Cunningham, he married Eliza Garrett in 1992. His stepson, Keaton Simons, is a singer-songwriter and his stepdaughter, Morgan Simons, is a chef. On January 12, 2001, Roberts visited The Howard Stern Radio Show with his wife during a segment called "The Gossip Game" with Mike Walker of the National Enquirer. He confirmed that he and his sister Julia Roberts had been estranged for several years. The source of the estrangement had been his past drug abuse and her siding with his ex-girlfriend over the custody of his daughter Emma Roberts. In 2004, he told People magazine that he and his sister reconciled when he visited her in the hospital after she gave birth to twins. In 1987, Roberts was arrested for possession of cocaine and marijuana and resisting arrest after he tried to assault a New York police officer. He spent 36 hours in jail, pleaded guilty to harassment, and had all other charges dropped. In February 1995, Roberts was arrested for shoving his wife, Eliza Garrett, into a wall. He subsequently announced that he was giving up drug use entirely. Roberts appeared as a cast member in the fourth season of the Vh1 reality television series Celebrity Rehab, for a dependency on medical marijuana. His wife, Eliza and his stepson, Keaton Simons, appeared in Episode 6 to discuss the effects of his addiction on their lives. Whole or part of the information contained in this card come from the Wikipedia article "Eric Roberts", licensed under CC-BY-SA full list of contributors here.